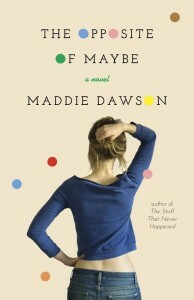 This post was inspired by the novel The Opposite of Maybe by Maddie Dawson. At the age of 44, Rosie finds herself suddenly single and pregnant. She tries to run away, hiding in her grandmother’s home, but instead is transformed by two men who change her life forever. Join From Left to Write on April 8 as we discuss The Opposite of Maybe. As a member, I received a copy of the book for review purposes. It wasn’t until Rosie’s hometown was revealed to be North Haven that I realized the author, Maddie Dawson, lives in my home state. Or, at least, lived there at some point. I was sitting in Starbucks, escaping from my workday for a brief moment, and I literally put the book down to absorb this information. Who writes about Connecticut, anyway? I pulled out my phone and performed a quick search, confirming–yup, only people who live here. And somehow, that made me feel a little more connected. North Haven–the location of the home where Soapie brought Rosie to raise her–is near West Haven, where my husband’s grandparents lived. His grandfather built the house himself and lived there for more than fifty years. I can still picture the road leading to the shore, less than a mile from his house on the hill. Both his grandparents passed away before we were married–his grandmother, sadly, suffered from Alzheimer’s the entire time I knew her. His grandfather was by her side as much as he could be, even when she eventually had to be admitted to a nursing home. He cared for her til her end. And then he didn’t last much longer before he went off to join her in the afterlife. When Rosie and Tony take Milo to Kid City in Middletown, I could imagine every step they took because I’ve brought my kids there many times before. When they were little and I was a stay-at-home mom, rainy days would be spent at Kid City (and places like it) in order to preserve some semblance of sanity. The kids could run around, burning off their abundance of energy, all while remaining dry. And I could escape the home, which could feel a bit like a cell if we were trapped there too long. The fish factory? That’s my kids’ favorite feature of this children’s hands-on museum. They would spend all day there, if I let them. The diner with the plastic food? I have “eaten” many meals there. The book nook? I can’t say I’ve never considered the room for the same purposes they used it. Or, at least had a passing thought that it would be a nice little place to get away for a smooch. With the door closed, of course. Little things like this made me feel more a part of Rosie’s life, even if we have nothing in common. And that was kind of cool. Have you read a book set in your home state? Did it change your experience with the book? I’ve definitely had the experience of feeilng more connected to New York-based or Boston-based authors since those are both places I’ve lived! Even just a mention of somewhere I’ve been, or can picture, makes me feel more into the book. Carrie, maybe we’ll see each other in Starbucks sometime! Yes, I live in Connecticut–and I’ve set all my books here. I’ve written two as Maddie Dawson, this one and The Stuff That Never Happened…and three as Sandi Kahn Shelton. What Comes After Crazy takes place in New Haven, A Piece of Normal in Branford, and Kissing Games of the World in Chester. I live in Guilford right now…and although it’s not my “home state,” (I’m from Florida and California) I’ve come to love it here, except when winter goes on for nine months, as it did this year! Glad you liked the book…and also glad you don’t have anything in common with Rosie. Her life was a little bit harder than most, I think! I’ll be on the lookout! I definitely need to pick up your other books now. Love it when there’s something to relate to–and that it’s not my life is a mess. 😉 It was so kind of you to stop by and comment–thank you! I love when you find that connection with a character, and I love the familiarity of books that take place where I live, Chicago. I thought Connecticut was the perfect place for Rosie, I’m not sure why exactly, but it suited her. You should look for Rosie at Starbucks!